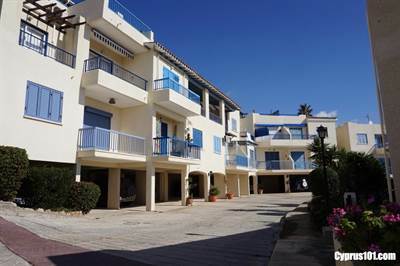 This well presented 2 bedroom apartment is located in the popular village of Chloraka. The home is also within walking distance to the beach and popular coastal path. There are a wide variety of restaurants nearby and good access to public transportation. The complex is charming in character with quaint stone featured walkways. It’s very well maintained with an organised management committee in place. The buildings have recently been painted and facilities include an impressive swimming pool, large surrounding sunbathing terrace with sea views, children’s paddling pool, changing rooms, toilets, indoor and outdoor showers, plus plenty of covered parking spaces. In conclusion, the property is ideal as both a permanent residence and holiday home and has full title deeds.